Schools in Cork, Cloyne and Ross, as elsewhere throughout the country, have been re-opening in recent days for the new academic year. 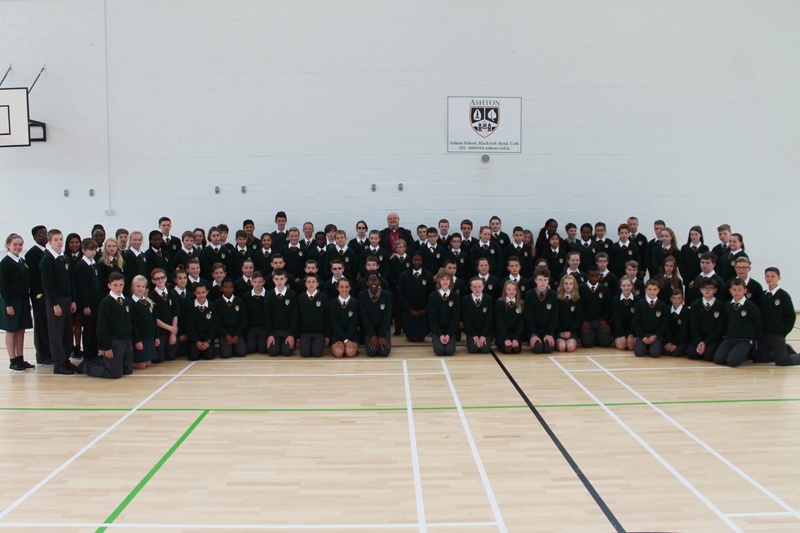 There are three Church of Ireland second-level schools in the Diocese, and each was visited by the Bishop, Dr Paul Colton, for their opening assembly of the school-year on Monday, 31st August and Tuesday, 1st September. Starting with Midleton College on Monday morning, the Bishop (who is also chairman of the Board of Governors, the Board of Directors and the Board of Management at the school) remarked that it was the first full academic year for the new Principal, Dr Edward Gash, and also a new beginning for the recently appointed Deputy Principal, Kevin Stanley. The Bishop presented insignia of office to the new prefects. This year, yet again, the College has an increased and record enrolment with 420 students. 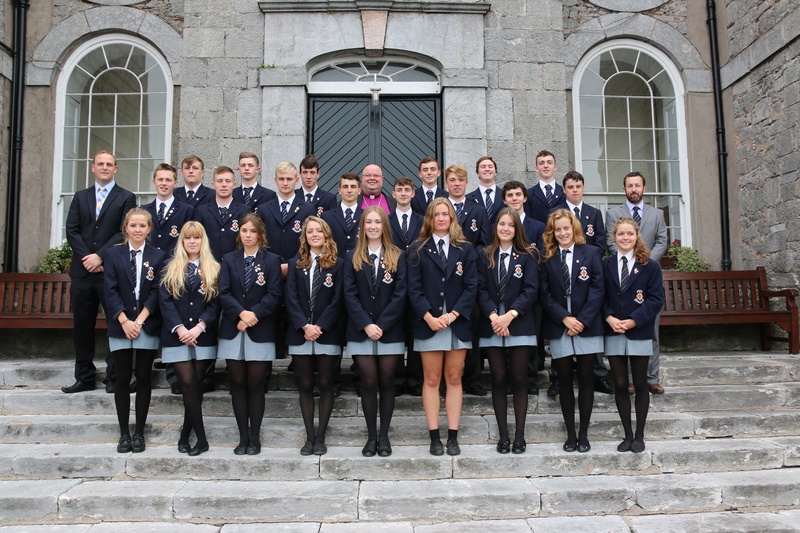 Bishop Paul Colton (centre of back row) with the new prefects at Midleton College, and (on the right), the School Principal, Dr Edward Gash, and (on the left) the new Deputy Principal, Mr Kevin Stanley. 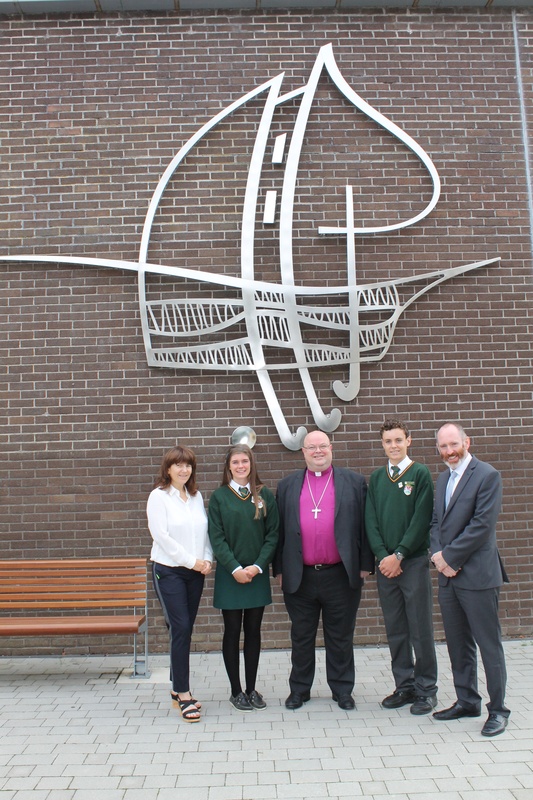 Later that morning, the Bishop was at assembly at Bandon Grammar School where there is also the largest ever enrolment at nearly 660 students. Addressing the students, the Bishop referred to the refugee crisis in Europe and challenged the students, not only to reflect on the chance fact that ‘accident of birth’ means that most of us were born on this side of the migration fence rather than the other. He said that part of the role of school was to give us the space and time, to learn, to grow, to identify our gifts, to dream dreams and to make plans, so that we can discover the vision, capacity and will to solve some of these major human challenges in today’s world. 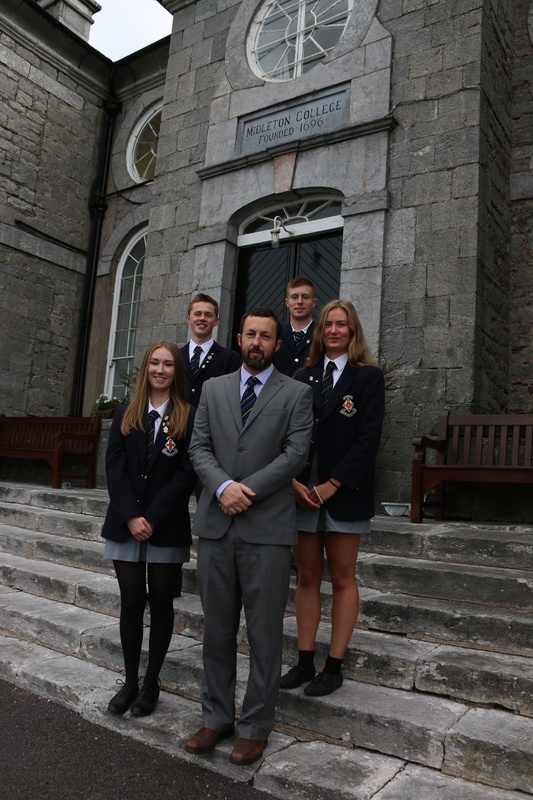 Afterwards the Bishop presented their ties of office to the new prefects and also congratulated the new Deputy Principal, Mr Donal Warren on his new appointment. 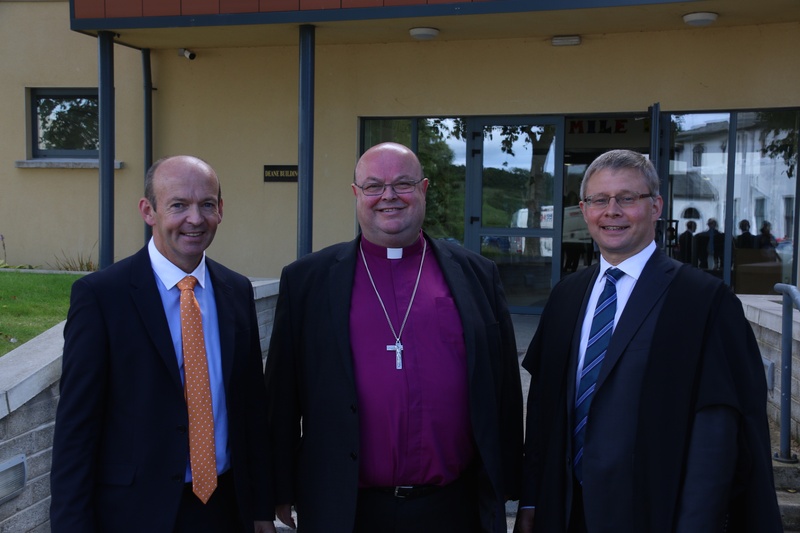 On Tuesday, 1st September, speaking at his own former school – Ashton Comprehensive School, Cork – the Bishop also focussed on the refugee crisis in Europe. In Ashton, this year, there are 520 students. The new head boy – Steven Jermyn – and the new head girl – Ally Lynch. Afterwards the Bishop met all the new first year pupils. 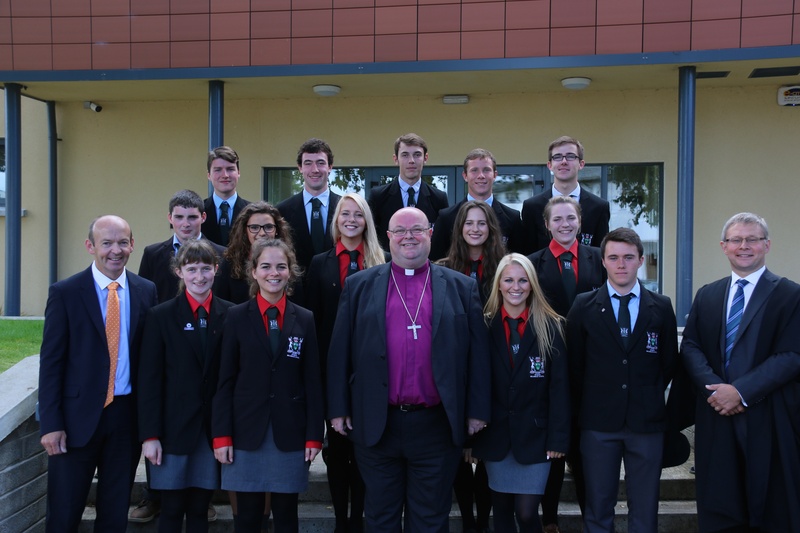 Bishop Paul Colton, past pupil of Ashton School, Cork (centre of back row) with the new first year students at the school. 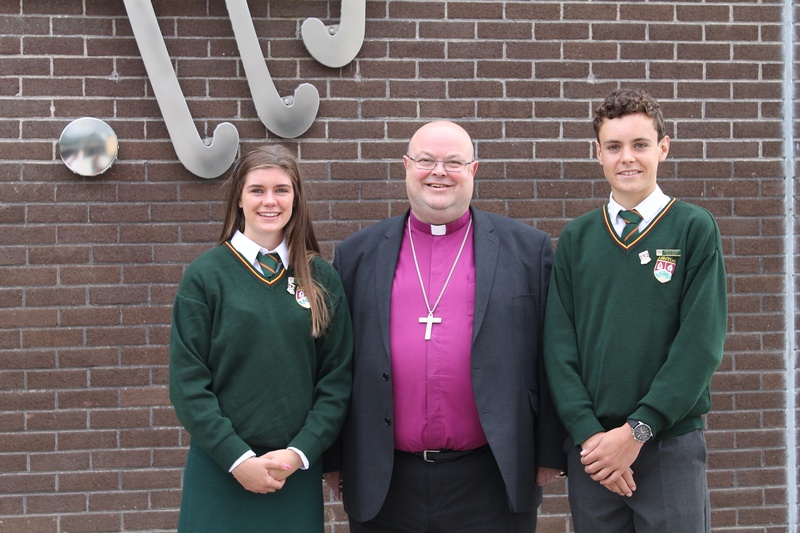 Head Girl, Ally Lynch, and Head Boy, Steven Jermyn meet the Bishop at Ashton School. Underneath the modern representation of the Ashton School crest on the wall of the sports hall are (l-r) Ms Anne-Marie Hewison (Deputy Principal), Ally Lynch, Head Girl, the Bishop, Steven Jermyn, Head Boy and Adrian Landen, Principal. The crest features the Bishop’s Mitre and the Mulberry leaf, and also the ship in the harbour of Cork from the City of Cork coat of arms, as well as a hockey stick formed, with the mitre, mulberry leaf and sail, into the Cross. Two new boys! 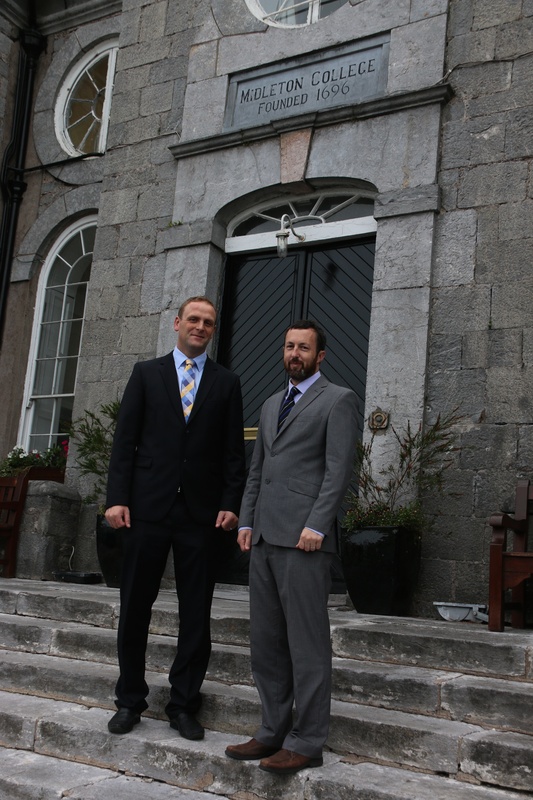 Dr Edward Gash (right) embarks on his first full academic year as Principal at Midleton College, and Mr Kevin Stanley, takes up his appointment as Deputy Principal. This entry was posted in Bishop, Church in Society, Diocese, Education, Schools in the Diocese. Bookmark the permalink.